6 Could the 6th army have been saved? In June 1940, Germany invaded the Soviet Union. It was a surprise attack and it was contrary to a secret treaty, agreed between Germany and the Soviet Union, in 1939. The Ribbentrop-Molotov was a non-aggression pact between Nazi Germany and the Communist Soviet Union and it was intended to ensure that neither country attacked the other. Up to one million German soldiers and their allies pushed into the west of the Soviet Union on the first day of the German invasion of the Soviet Union. As a result of their tactical surprise, the German army achieved a serious of spectacular victories. The Germans despite heroic Soviet resistance seized much of present day Belorussia, Ukraine and the Baltic States. The Red army suffered spectacular reverses and sustained massive losses. Hundreds of thousands of Soviet troops were killed and up to a million and a half taken, prisoner. A quarter of a million men surrendered during the German capture of Kiev, alone. The Nazi invasion had been facilitated by the indecisiveness of Stalin, he was taken aback by Hitler’s betrayal and he initially refused to believe the reports of a German invasion. The supreme leader of the Soviets possibly suffered a nervous breakdown in the early stages of the Nazi invasion. However, after a period of time, he was able to lead the Soviet Counter-Attack. By the autumn of 1941, it appeared that Germany’s blitzkrieg tactics would lead to the defeat of the Red army. However, winter arrived early that year and this began to slow down the German advance. Russians spoke of ‘General Winter’- who would help them to win the war. The Soviet people were well aware that the severe Russian winters would slow if not halt the German advance, just as it had stopped Napoleon and Charles XII of Sweden, during previous invasions. By December 1941, the German’s vanguard was ‘some fifty miles from Moscow.’ However, the weather was cold and German soldiers had begun to suffer terribly in the conditions. The Soviet’s used the weather to their advantage. Stalin had stationed huge forces in the east in to defend Siberia from a Japanese invasion. He withdrew them and under General George Zhukov then were organized into a strike force aimed at repelling the German advance on Moscow. On December 12th, Zhukov’s army launched a surprise attack on the German frontline and pushed them back with heavy losses some one hundred miles from Moscow. The Soviet Capital had been saved. However, despite the setback, the Germans had a secure hold over much of the west of the Soviet Union and had laid siege to the city of Leningrad. Hitler saw the war in terms of his personal rivalry with Stalin and he decided to attack the city, because of its symbolic value. However, the original aim of the offensive in Southern Russian was to secure the oil fields in the Caucasus. The oil was essential for the German war machine. Hitler knew this – instead of opting for concentrating all his forces on the conquest of the oil fields, he made perhaps a fateful mistake. He divided his forces. It has long been one of the fundamental beliefs in military strategy that it was reckless to divide one’s forces in enemy territory. However, this is exactly what Hitler did, contrary to all the advice of his Generals. He sent some of the German army south to take the oil fields in the Caucuses and their prime objective was Baku. Hitler then ordered the 6th Army to advance towards Stalingrad and to take the city, even though it had really only symbolic and no strategic value. Hitler was fixated by the idea of capturing Stalingrad and it became his personal obsession and this led him to ignore the reality on the ground and this was to lead the German 6th army to disaster. Not only had Hitler divided his forces, but he also allocated too little men and material to the capture of Stalingrad. It was usually accepted at the time and since that an attacking force needs to have at least a 3 to one advantage over the defenders in order to achieve their goals. The Germans did not have any such numerical advantage over the Soviets. This made the 6th army’s prospect of success very uncertain. Furthermore, Hitler in his obsession to seize the city meant that he was not fully aware of the situation around the city. For example, German forces had been unable to push back Soviet forces during the series of battles known as the Kolton Operations. This was to leave the Germans very exposed as they pressed further into the city and left them at risk of being outflanked. Because Hitler divided the German forces, the flank of the 6th army was insufficiently protected. Poorly trained Romanian and Italian forces guarded the flanks and many German commanders privately believed that they could not protect their rear from Soviet attack. 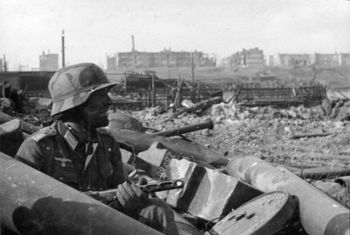 Hitler’s determination to capture Stalingrad meant that he dispatched the 6th army on a mission that was unlikely to achieve its objectives and placed it at great risk. Because of his obsession Hitler ignored his generals' advice. Hitler as a result of his interference and his fixation with Stalingrad he destroyed the 6th Army. Hitler's style of leadership was the complete opposite of Stalin's. The Soviet leader, had reformed the Soviet High Command, the Stavka, and granted ‘more autonomy and independence’ to capable generals such as Zhukhov. The leader of the Soviet Union had learned lessons from the early days of Operation Barbarossa. He let his generals do the fighting and draw up the strategies needed to beat the Germans back. . The Germans launched a massive air assault on the city, under the command of General Paulus. Much of the city was reduced to rubble. The German’s devoted some of their finest units to the capture of the city, much against senior Generals such as Von Kleist’s wishes, who openly opposed Hitler’s wish to capture the city. In August of 1942, the Germans fought their way into the city, which was at first lightly defended. The Soviet commander of the Soviet forces was Vasily Chuikov, who was 42 years old and led the Soviet 62nd Army. He was to prove to be an indomitable fighter and an inspirational leader.</ref> Beevor, p. 173</ref> He organized his army and many of the city's civilians into a formidable defensive force. Chuikov and the defenders used the rubble of the city as defensive cover and to slow down the German advance. They also put up a suicidal resistance and fought for every street and building. Soviet snipers decimated the German forces. After three months of fierce fighting, the German’s eventually captured some 90% of the city and had reached the Volga. It appeared that they were on the verge of victory. The Soviets had been building up their forces in great secrecy to the north and the south of the city. Amazingly, German intelligence did not spot the massive build-up of Soviet divisions. The Soviet’s under Zhukov attacked the 6th army’s flank as they continued to capture the last remaining pockets of resistance in Stalingrad. The Soviets deliberately selected those sectors of the German’ lines, held by their allies, such as the Hungarians and the Romanians. The Soviet High Command, estimated that these units would not fight and would quickly surrender. 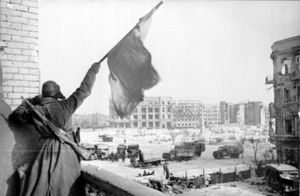 On the night of the 23rd of November, the Red Army attacked and quickly swept passed the Hungarian, Rumanian, and Italian divisions and they began to encircle the 6th army in Stalingrad, just as it was on the verge of seizing the city. By 1942 Hitler had largely been very successful in all his campaigns. He had only experienced defeat at the Battle of Britain and before Moscow. However, on the face of it, neither defeat had stopped the German war machine from going on the offensive and from securing more victories. 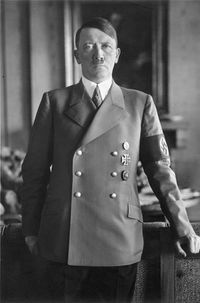 Hitler, as commander in chief of the army, had great faith in his personal military abilities and as a strategist. He believed that he was a military genius and that he was destined to lead the German people to victory. Central to Hitler’s views on military tactics was that willpower could achieve anything in the battlefield. Hitler believed that if German soldiers were well-led and motivated then there was nothing that they could not do, no enemy that they could not defeat. Hitler when he heard that his army was on the point of being encircled at Stalingrad, ordered that the 6th Army should not retreat and he demanded that they fight on with greater zeal. Hitler, while admitting that the situation in Stalingrad was dire, believe that if the German soldiers and their officers had faith in the final victory then they would be victorious. This belief meant that Hitler curbed his officers' ability to respond to the developing situation on the ground. The Soviet counteroffensive, which was launched on 19th November, from the Kalmyk Steeped, in a pincer movement, simultaneously attacked the Germans from the North and outflanked the 6th army. Eventually, the Red Army would come to completely encircle the Germans, but this took a week or more to achieve. In this time, Paulus could have retreated west and towards Von Manstein who was fighting in the Crimea . Before the encirclement was complete Paulus should have left Stalingrad and ordered a retreat. However, because of Hitler and his orders, Paulus stayed in Stalingrad and he and his army became trapped in the city on the 23rd of November, 1942. Over a quarter of a million Germans had been cut-off in the city on the Volga. Undoubtedly, Paulus own indecisive character played its part, but Hitler’s orders to stand and fight and never to concede ground meant that the Germans did not conduct a tactical retreat and avoid the slow death of the 6th army in the winter of 1942-43. Could the 6th army have been saved? News of the encirclement of the German divisions under Paulus was a severe blow to Hitler and he ordered an immediate attack to relieve the encircled forces in Stalingrad. Goering intervened and believed that the Luftwaffe or German air force could re-supply Paulus’ army. Goering promised Hitler that he would supply the Germans in Stalingrad with all that was needed. In the end, the Luftwaffe’s efforts to supply the besieged forces was totally inadequate. It has been estimated that the German air force only dropped one-quarter of the material and the food that the German soldiers needed to fight and survive in the Russian Steppe during the winter. The failed Luftwaffe efforts to supply German soldiers caused morale in the city to fall. Many German officers even argued that they should surrender. During December 19th, the gifted German General Eric von Manstein and a significant number of German division attempted to reach Stalingrad. Operation Winter Storm was initially successful, despite it occurring during the depths of winter. Von Man stein’s forces came within thirty kilometers of the besieged Germans, but Paulus refused to breakout and link up with the relief forces. He possibly could have saved some of his forces. However, this would have required him to disobey Hitler’s explicit orders. In the end, he refused to do so and the opportunity was lost. If Hitler had allowed his generals more flexibility, then Von Paulus could have saved some of his divisions from complete annihilation. In February 1943, Von Paulus, surrender the remaining, starving and ragged German forces in Stalingrad. Finally, he had defied Hitler’s orders to fight to the last man and bullet. The German defeat had been devastating. They had lost half a million, either killed or captured. The Germans after the Soviet victory lost a significant amount of territory in the south of Russia. However, the German army was far from defeated and in early 1943, Von Manstein inflicted a devastating defeat on the Red Army at Kharkov. However, the German army had lost its aura of invincibility and its enemies were no longer afraid of it and believed that it could be beaten. Furthermore, after Stalingrad, many more Germans became critical of Hitler and his policies, this was particular the case in the German military and there have even been suggestions that after the debacle that the German generals conspired to start a mutiny in the army and depose Hitler. However, these plots came to nothing. Stalingrad was one of the most important battles in WW II if not in entire human history. It was a catastrophic defeat for the German army and it could be argued that they never recovered from the battle. The defeat was avoidable. The main reason for the defeat was that Hitler became obsessed with the idea of capturing the city, named in honor of Stalin. This led him to ignore his Generals warnings and to make several strategic mistakes. The mistakes and errors of Hitler meant that the Soviets could take advantage of the situation to encircle and annihilate an entire German army. The responsibility for the cataclysmic defeat was Hitler's. Furthermore, he compounded his initial errors, by refusing to allow Paulus to force a way out of Stalingrad his General could have saved some of the German forces, and mitigated the consequences of Hitler’s mistakes. Hitler’ meddling, misguided strategy, and poor tactics meant that the 6th army was doomed to defeat at Stalingrad.